The thyroid glands (glandulae thyroideae) of birds are paired, oval shaped organs, located on the ventral side of the base of the neck, each on either side of the trachea. They lie close to the common carotid arteries and jugular veins. 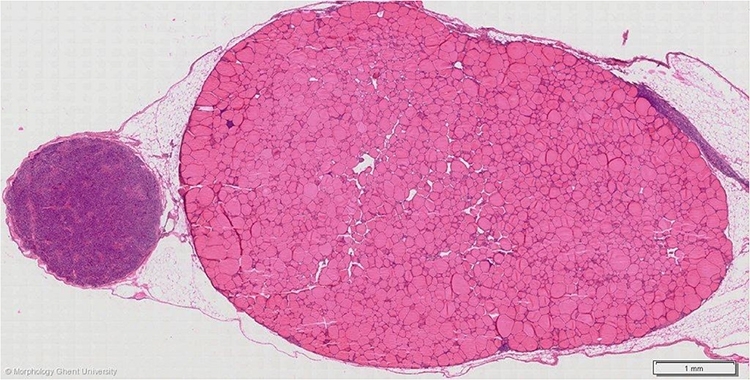 The micrograph above shows the left thyroid gland with its craniocaudal axis horizontally orientated. Left on the picture, closely to the caudal pole of the thyroid gland lies the parathyroid gland (glandula parathyroidea). A small remnant of the thymus can be seen on the right.